Deputy Director Tracie Guy-Decker and Director of Collections and Exhibits Joanna Church collaborated on this month’s edition of JMM Insights which, somewhat coincidentally, is all about collaboration! Missed any previous editions of JMM Insights? You can catch up here! Have you ever heard of “The Mill” at Stevenson University? Well until last year we hadn’t either. That’s when we held a new projects briefing for Will Backstrom, Senior Vice President for Client and Community Relations at PNC Bank. Will, who has been a great friend and supporter of JMM, stopped the conversation when we brought up the topic of Fashion Statement (the exhibit on the way in which clothing expresses personal and social identity) and Stitching History from the Holocaust (a traveling exhibit from Milwaukee. that celebrates the creative talents of a designer who perished in the Shoah). The “Mill” it turns out, is a capstone course for students at Stevenson University with an interest in design. It brings together students from departments like Fashion Design, Graphic Design, Film & Moving Image, and Business Communications to work together, almost as if they were a design and marketing agency, on solving a specific, real-world problem. With Will’s help, JMM, the Maryland Historical Society, and Stevenson U faculty and students came together and we became “clients” of the Mill. 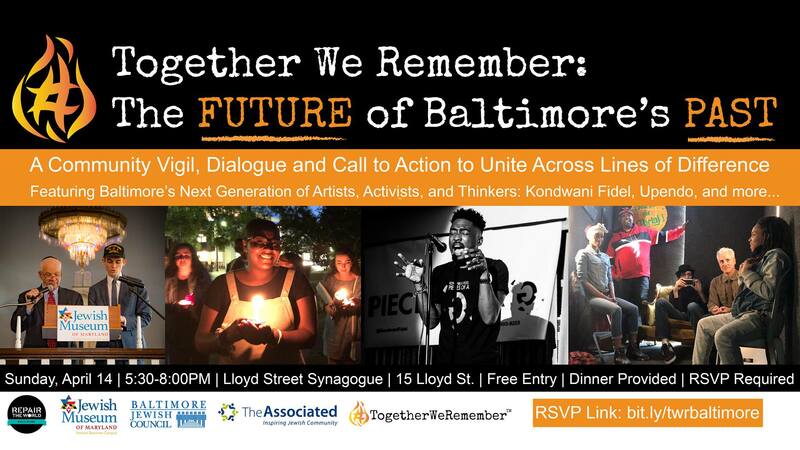 Stevenson students in the Mill are incorporating our project into a much larger endeavor: a public affairs campaign to reinvigorate the fashion industry in the city of Baltimore. 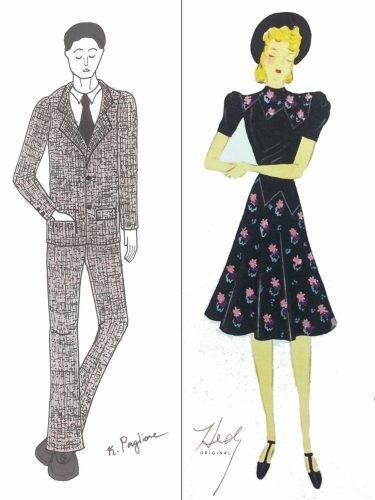 They developed a name for the effort (Stitching MD Together), a brand (stitchingmdtogether.org), and a full plan to research, educate, engage, and, they hope, encourage a growth in the fashion industry in the state. They are even hoping that, when the Maryland campaign is successful, other states can use the same template. As part of this collaboration, JMM staff have visited the Mill classroom a number of times, listening to student presentations, discussing the upcoming projects, and even presenting a unit on social media marketing. 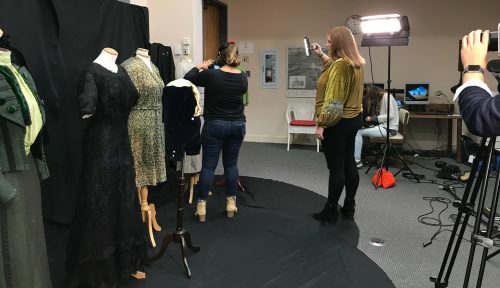 Students have also used JMM and MdHS for their research into the history of the fashion industry in Baltimore and in Maryland and are creating a documentary film. Their research proved interesting and productive in more ways than we initially anticipated! Stevenson University students setting up for documentary filming in the JMM Library, October 26, 2018. 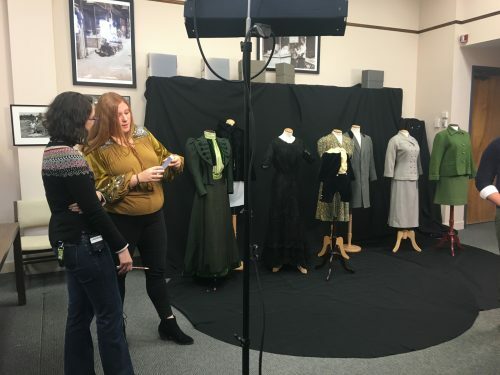 As part of the students’ documentary project, they came to the JMM to interview Joanna, and film some of our textile collections. To make sure those pieces got a good showing, Trillion and Joanna turned the library into a miniature photo studio and prepped a variety of outfits to a presentable display standard, ready for their respective close-ups. A handy side benefit of this process was that we were able to take some good photographs for our own purposes, in advance of the upcoming Fashion Statement exhibit. 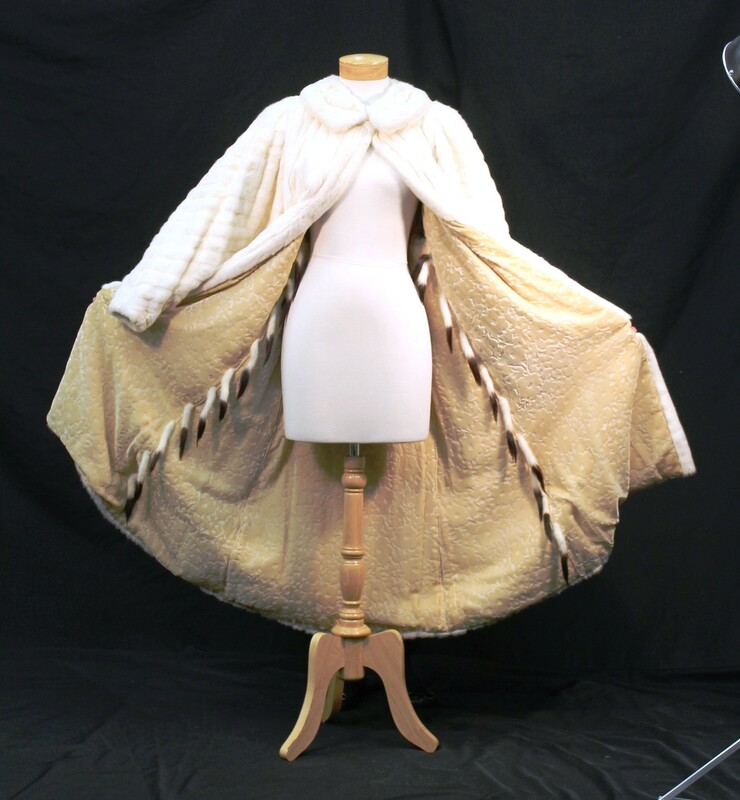 This ermine coat (complete with tails sewn into the interior seams), made by Havelock and Selenkow, Baltimore, was a 35th birthday present to Alene Steiger Adler from her husband Charles Adler, Jr., in 1941. It will be featured in “Fashion Statement,” opening April 7, 2019. 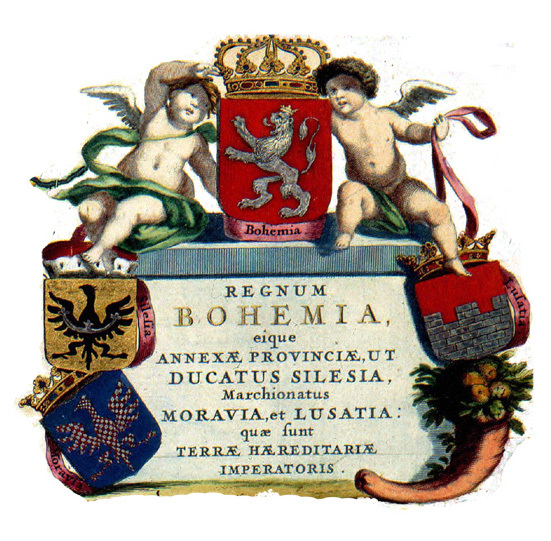 Gift of Amalie Adler Ascher, JMM 1989.167.30a. The student film crew got some on-the-ground experience (not that they weren’t already quite skilled) along with the footage they needed for their documentary. In addition, they got the chance to take a close look at museum artifacts, and at techniques for interpretation and display. An article of clothing can tell you so much about the person who wore it and the times and culture in which it was worn, but people haven’t always given that idea much thought; sharing that insight, and seeing students’ respond to it, is a delight. We think this deeper understanding of the roles of clothing and fashion will help them strengthen their campaign. Joanna talking with Grace Clark, part of the Stitching Maryland Together Communications team, prior to the interview. 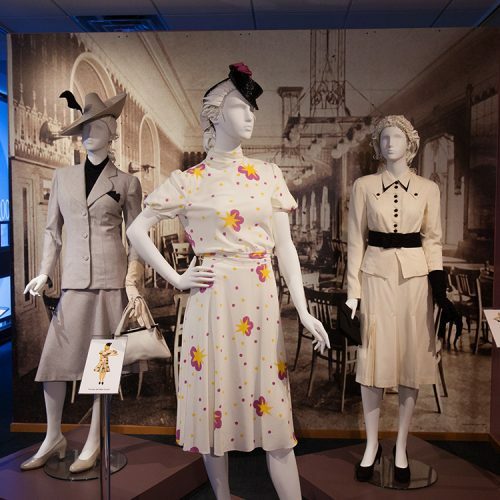 In addition to the deliverables of the research and the documentary, we’ve also been partnering with Stevenson students for some of the details of the visitor experience in Fashion Statement, the JMM-curated portion of the double-bill opening April 7th. The interactive experiences in our exhibits are often among the most memorable to our visitors, and among the most complicated for museum staff to create. For Fashion Statement, Stevenson professors have helped us brainstorm interesting mechanisms for engaging visitors even as their students are helping us make those ideas a reality. We are working with several different Stevenson classes and individual students to achieve the interactive visitor experience. From graphic artists to aspiring fashion designers, the collaboration with the University is providing JMM with fresh ideas and talent as well as providing students with real-world, client-driven experiences. All of these many positive outcomes have much to remind us about the power of partnership and collaboration. And with deep gratitude to Mr. Backstrom, whose eyes lit up when we told him about Fashion Statement, we reiterate the truth of the fact that one person has enormous power to make a difference: all of these synergies and win-win moments were made possible by a single conversation many, many months ago. This month’s edition of Performance Counts is from School Program Coordinator Paige Woodhouse. To read past editions of Performance Counts, click here. To read more posts from Paige, click here! 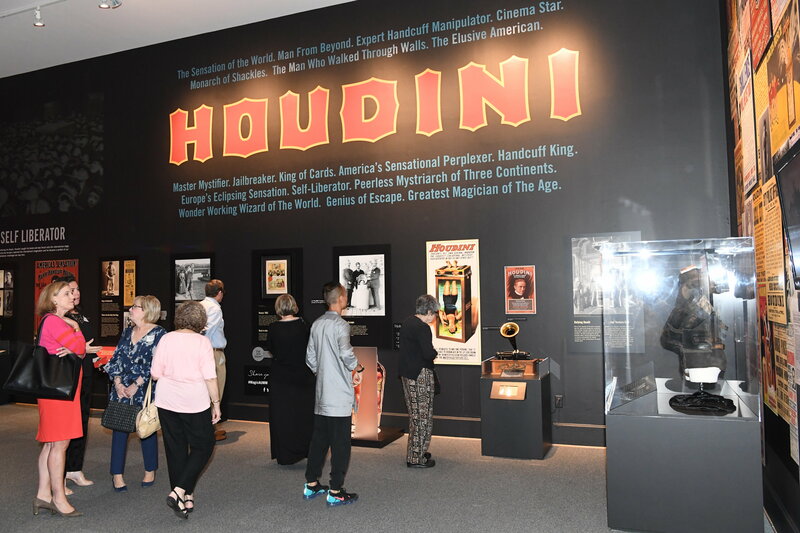 It is no illusion that Inescapable: The Life and Legacy of Harry Houdini, a JMM original exhibit, captured the attention of many while on display for the past six months (June 24th, 2018 to January 21st, 2019). In fact, over 8,900 visitors came to experience this magical exhibit. 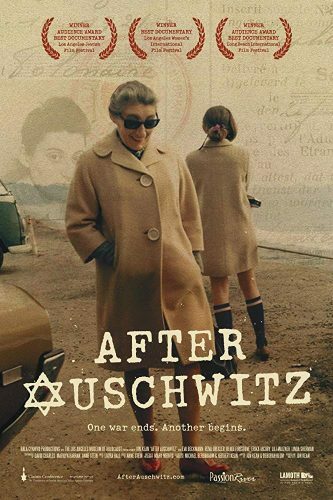 So now, after the exhibit has hit the road – next appearing at the Breman Museum in Atlanta and then, if things go according to plan, at the Jewish Museum Milwaukee, let’s look at some of the numbers that capture this monumental success. Of the 8,900 people who visited, general attendance made up 4,600 of these visitors (that is, individuals who did not come as a part of a school group, adult group, or for a public program). You may have been one of the many Houdini enthusiasts, magicians-in-training, history lovers, or those learning for the first time that Houdini was Jewish, who joined us to explore Houdini’s life and legacy. In fact, you may have been part of the 58% of people who visited the JMM for the first time during this exhibit! If so, welcome! Please come back and see what we have in store next. People came from all over the world, including Ireland, Australia, Mexico, and Japan. While only 2% of our visitors were from other countries, this exhibit captivated our home audience, with 72% of people coming from Maryland and 26% from other States. Dai Andrews performing a great escape at the Magic of Jonestown Festival in July (Photo by Will Kirk). 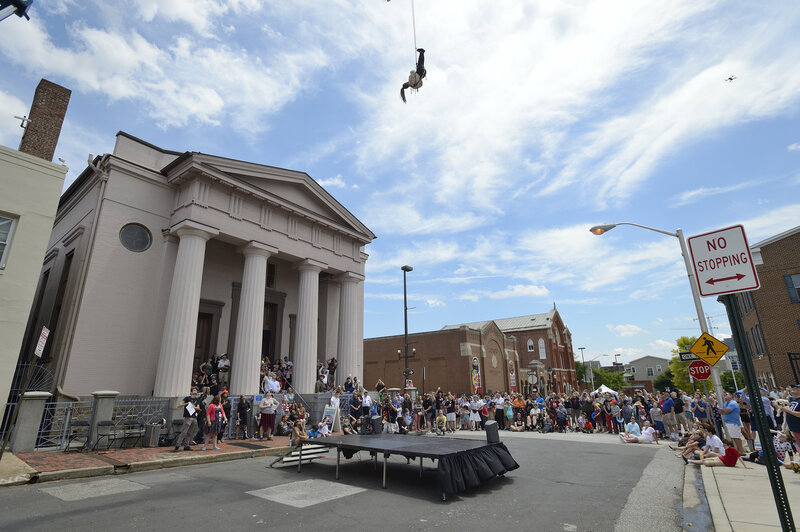 From films and book talks to escape artists and magicians, the Museum hosted an array of Houdini-related public programs for 1,900 visitors. Highlights included the Magic of Jonestown Festival, the 91st Official Houdini Seance hosted on Halloween and A Fantastical Farewell to Houdini where Magician Brian Curry performed to a standing room only crowd of 180 people. A Fantastical Farewell to Houdini. Brian Curry and audience assistant performing for the crowd. Thirty-eight public, private, and Jewish schools and camps made up of over 1,800 students, teachers, and chaperones who visited to learn about the story of young Erik Weisz immigrating to the U.S and transforming himself into Harry Houdini. Students worked together to crack the code and reveal one of Houdini’s famous illusions — the disappearing elephant. They were immersed in a personal story of immigration, the performing arts, and the technologies and entertainment trends surrounding the turn of the 19th century. Students from the National Academy Foundation tried out the Spirit Photograph to see if Houdini would appear during their visit in October. 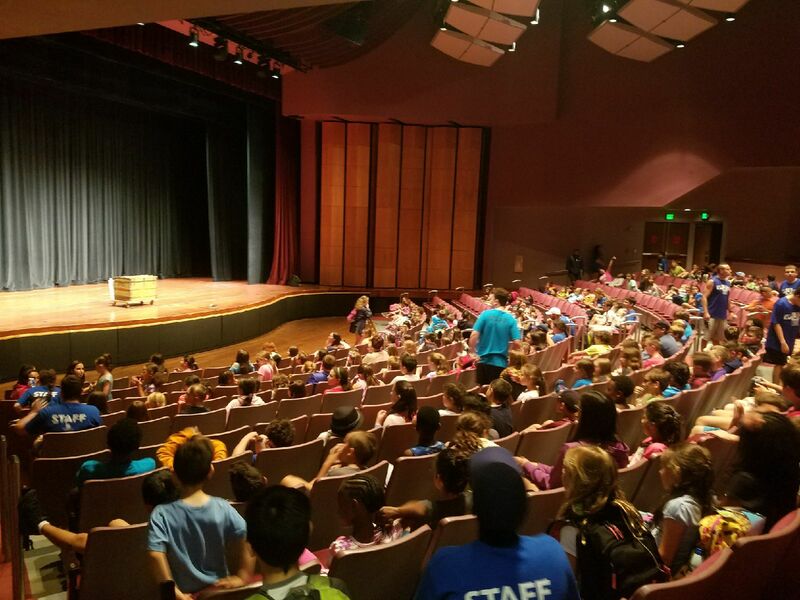 Students didn’t just engage with Houdini while at the JMM, over 2,400 students, teachers, and chaperones had a visit from Harry Houdini himself at their school or camp. 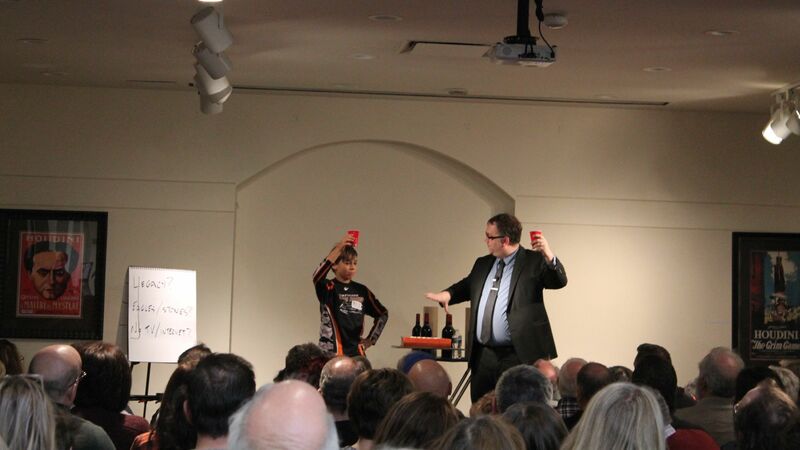 David London, magician and guest curator of the exhibit, performed as the Museum’s newest Living History Character. Harry Houdini didn’t just perform for schools, he also entertained adult groups and public programs at the JMM, performing 27 times for over 3,100 audience members in total. This dramatic performance hasn’t come to an end yet. Just as Houdini’s legacy lives on, our Living History Character of Harry Houdini has another 9 performances scheduled before the end of April. 250 campers at Habimah Arts Camp waited for Harry Houdini to take the stage at one of his many performances at Jewish Camps and Schools. 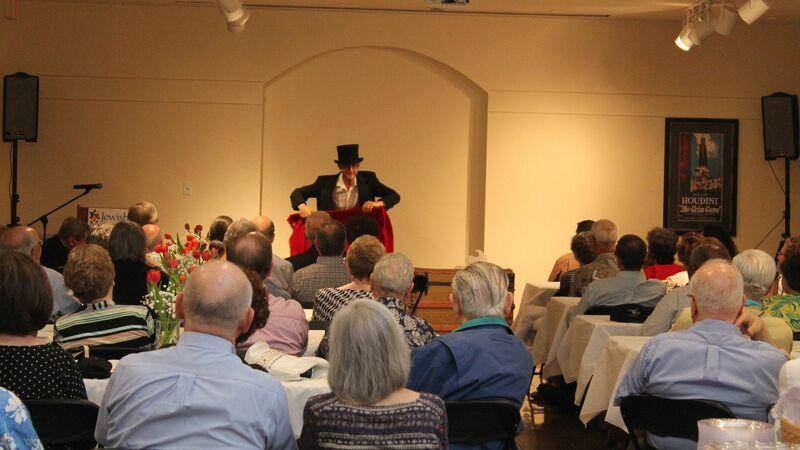 David London Performing as Houdini at the JMM. Schools were not the only groups enjoying the opportunity to try out some of Houdini’s magic tricks on display, 640 attendees from 39 adult groups explored the hands-on illusions and rare artifacts on display. Residents from Brightview enjoyed a tour by our Director of Learning and Visitor Experience, Ilene, in July. With numbers like these, it is no surprise that the month of December 2018 was the highest single-month onsite attendance in the last seven years with 1,909 visitors to the Museum. 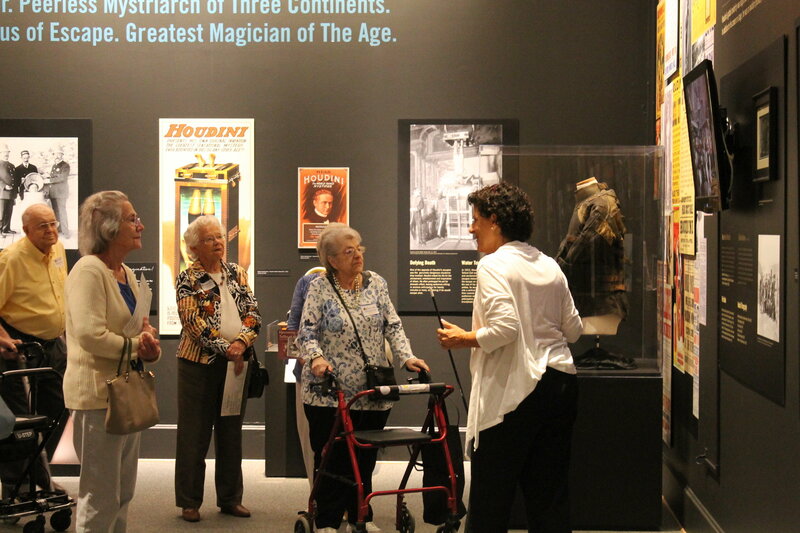 Whether it was trying out magic tricks from Esther’s Place, conducting more research on Harry Houdini after your visit, sharing something new your learned with a friend, or visiting another Museum (or coming back to visit us again! 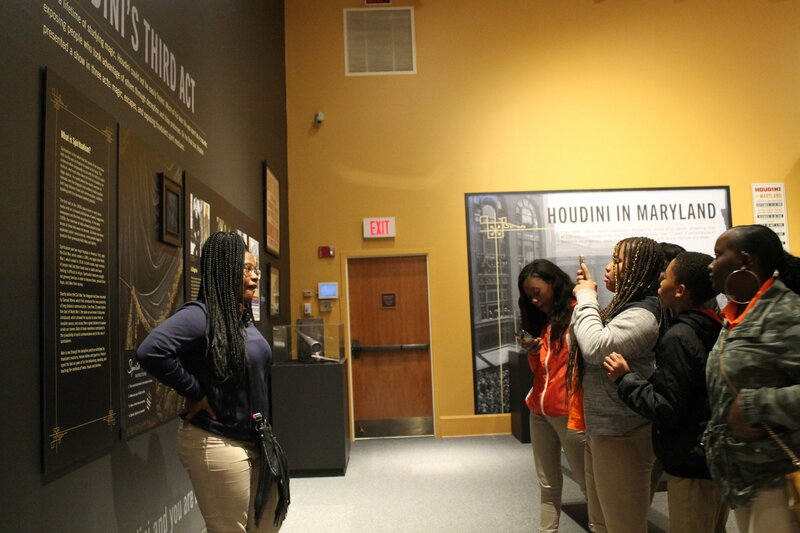 ), we hope that Inescapable: The Life and Legacy of Harry Houdini was not just a success as determined by the numbers, but a memorable experience that inspired you after your visit.